With spring weather just around the corner (well, hopefully…), there comes a time when the puffy winter coats have to be put away and the spring-cleaning has to start. Instead of dreading the annual cleaning catastrophe, use the event as a reason to update that worn-out winter décor and freshen up your home to with the latest decorations! A short walk off of Missouri’s campus you’ll find the chic downtown store, Calhoun’s Accent Furnishings, home to of all the latest furnishing trends. 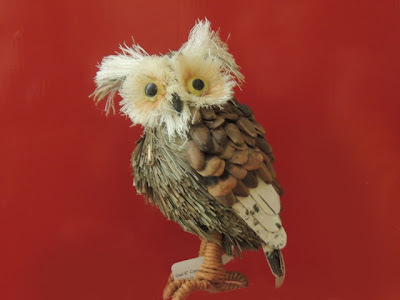 Calhoun’s specializes in anything from small gifts to unique home-décor, and upon a recent visit, I have found that owls are ‘in’ this season and was given a small preview of one of their popular owl items. Read on to see how you can win this special treat from Calhoun's! After getting quite a hoot (sorry, I had to) from this owl trend, College Gloss Mizzou decided to take a closer look at where we could find more of these trendy tree-inhabiting animals. It turns out that 2013 might not be the "Year of the Snake" as determined by the Chinese, but rather the "Year of the Owl!" Carrying anything from cookie jars to wall hooks and even sticky notes, Pier 1 is on the prowl for owls and has captured our hearts with their cute home décor. This trendy store never fails when it comes to finding unique and international décor, knick-knacks, furniture, and of course, my favorite food! Check out what owl-inspired decorations they have to brighten up your room! And I know it doesn’t count as so-called ‘home-décor,’ but who couldn’t resist buying this?! So when looking to welcome spring into your newly cleaned home, make sure you visit Calhoun’s and some of these other stores to help incorporate the season’s newest trends in your décor! Now that you've seen just how hot owls are this season, here's how to get in on the trend by winning our giveaway! One lucky winner will receive this owl from Calhoun's. All you have to do to enter is like College Gloss Mizzou on Facebook and comment with your name and email address below. Please note: the winner must reside in Columbia, Mo., or a surrounding area.